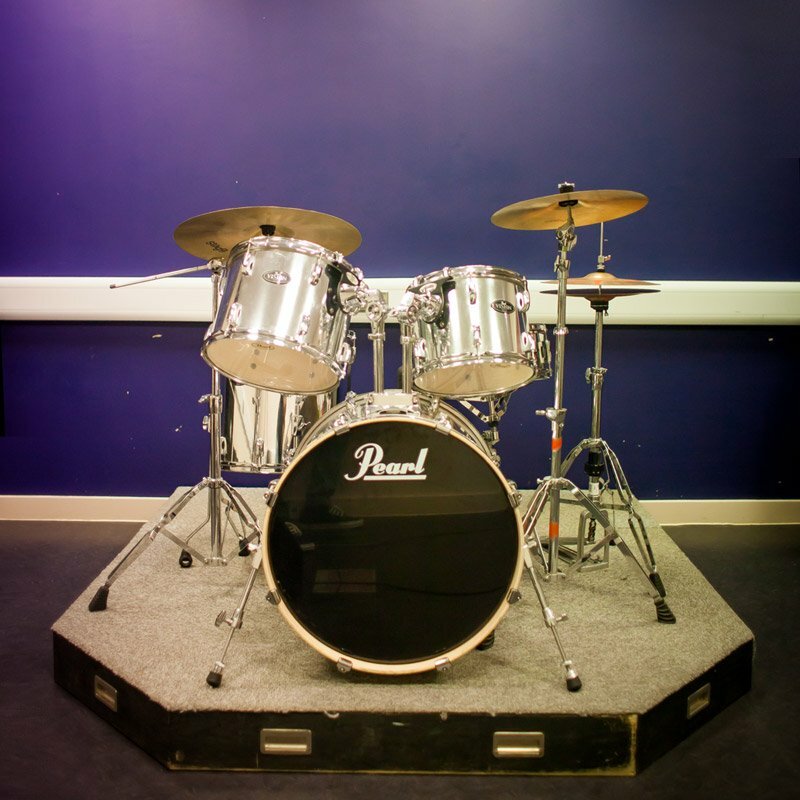 You are here: Home › where should I rehearse in London › What makes a good rehearsal studio › what is a good rehearsal room in London › Tips for booking a London rehearsal studio? Want a few tips for booking a London rehearsal studio? We are assuming that if you are interested in this article, you are fairly new to looking for a rehearsal room. It isn’t really aimed at signed bands on big budgets, who have management companies to arrange all that for them! Here are some points to bear in mind. 1. 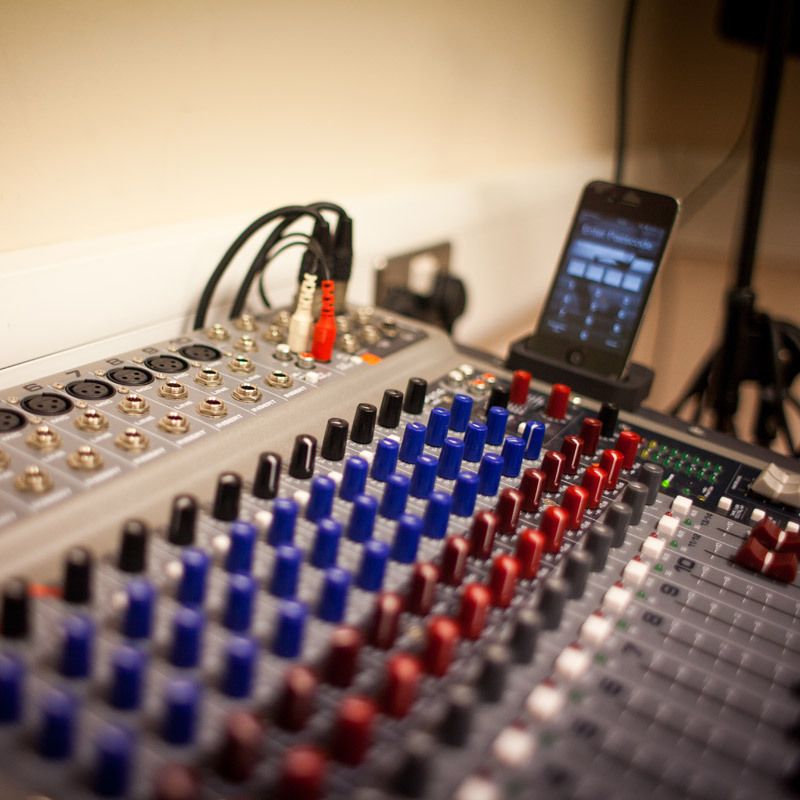 Make sure the studio has good quality equipment and it is well maintained. By law all equipment in studios should be PAT tested. You will know this has been done because the equipment will have small stickers on it. If a studio doesn’t have this, it may be unsafe. Also check the general condition of the studio equipment. If a studio has a website, check the gear listings. 2. The studio must be convenient for everyone who uses it. This is not always possible, but so some compromises are necessary. If you all have to travel by public transport, make sure there are good public transport links. If you all come by car, make sure there is convenient parking. We’ve put details of all local bus and train services on our webpage, so you can see if our studios are convenient. If you can’t easily get to a studio, then no matter how good it is, then it is not much use to you. 3. 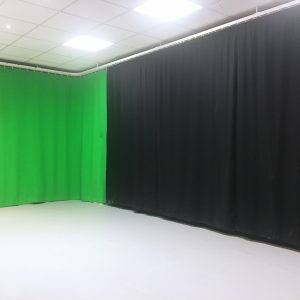 What equipment do you want/need the studio to provide and do they charge extra for it? 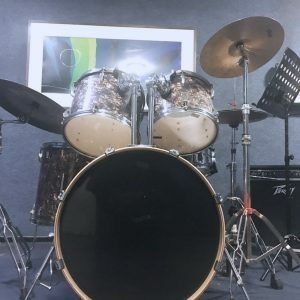 If a studio has decent equipment and well maintained drumkits, then you can save up to an hour of your rehearsal time, if you book studio with the equipment set up. Unpacking and setting up a drumkit can take up to half an hour (as can putting it away). Whilst this is being done, the band are not rehearsing. If a drummer likes their snare sound or cymbals, get them to bring these. Fitting these will take five minutes. If you have all of the gear you need, it is still worth making sure the studio has equipment to hire. If you get to the studio and your amp packs up, then the rest of the band have a wasted journey. This is less of a problem if you are all local, but if you’ve travelled, it can be a nightmare. It may be worth checking with the band whether they have storage facilities. Lugging heavy cabs around can also end up being a real bugbear. 4. Does the studio have refreshments and food on site? If you are rehearsing for 3-4 hours, then this can become important. Smaller studios will often expect you to simply bring your own snacks etc. Ask if they have hot rinks or a kettle. Larger studios (such as Mill Hill Music Complex) have full vending facilities available. 5. Are the rooms suitable for your purposes? When you book a room, always ask whether it is suitable for the number of people using it. If you have a large band, then you may not all fit in the cheapest and smallest room. Also make sure how many mics can be used on the PA system. if you have six singers but the studio only has two mics, then that will interfere with your rehearsal. 6. Make sure everyone knows where the studio is. 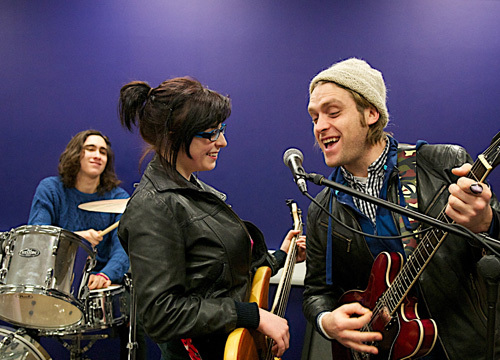 When new bands form, often the members will not have met before. make sure that the studio has adequate directions on their website. Also make sure that the surrounding area is safe. It can be scary walking into an unfamilair area with an expensive musical instrument. 7. Check to see if the studio does any deals or cheap times. 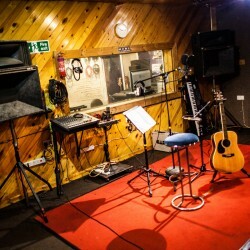 (Mill Hill Music Complex has some of the cheapest off peak rates in London(full details here – https://www.millhillmusiccomplex.co.uk/rehearsals.php ). If you can get in for 11am on a Saturday/Sunday morning (or before 6pm during the week), you can save a bundle. Always check that these deals don’t have any catches (ie you need to hire the equipment as extras). 8. Can you get in to rehearse at a time that suits you. Before booking a studio, make sure that everyone in the band is able to get there for the time of the booking. If you have booked a studio from 7pm until 11pm, but the drummer can’t get there til 8.30, pm is it worth booking. Many bands argue and split up due to people not being able to get to rehearsals. Make sure that you all set a time you can attend (at a venue you can get to). Most London Studios get busy during the week Tues- Thurs 7-11pm. If you want a particular studio at this time, book well in advance. Most studios charge nothing for cancellations more than 72 hours before the session. It is worth checking the cancellation policy before you book. 9. Does the studio sell spare sticks, batteries and strings. many smaller studios don’t sell these. This isn’t in itself a problem, but if they don’t make sure you have spare sticks, leads etc. If something breaks, then you don’t want to have tot pack up and go home. If they don’t, pack spares. 10. Are the staff at the studio helpful? Studio staff are paid to make sure your rehearsal goes smoothly. If you get poor service, it is always worth contacting the studio afterwards and explaining the problem. Most decent studios will try and make amends (be it a reduction on the next session or a free pot noodle). Most studios appreciate feedback on how they are doing. (If you are unhappy with any aspect of your service at Mill Hill Music Complex, please email us and let us know). And finally. Making music is a fantastic thing to do. Rehearsals should be fun. The studio should do their bit to make your session go to plan. If you had a bad rehearsal and that was down to the studio you used, then try somewhere else. Many good studios have testimonials from customers. Another good idea is to check Google reviews. These will give you some idea as to whether a studio is popular with customers and what the issues are. I’ve used Mill Hill Music Complex for 5 years for drum rehearsals and now I use it for teaching as well. 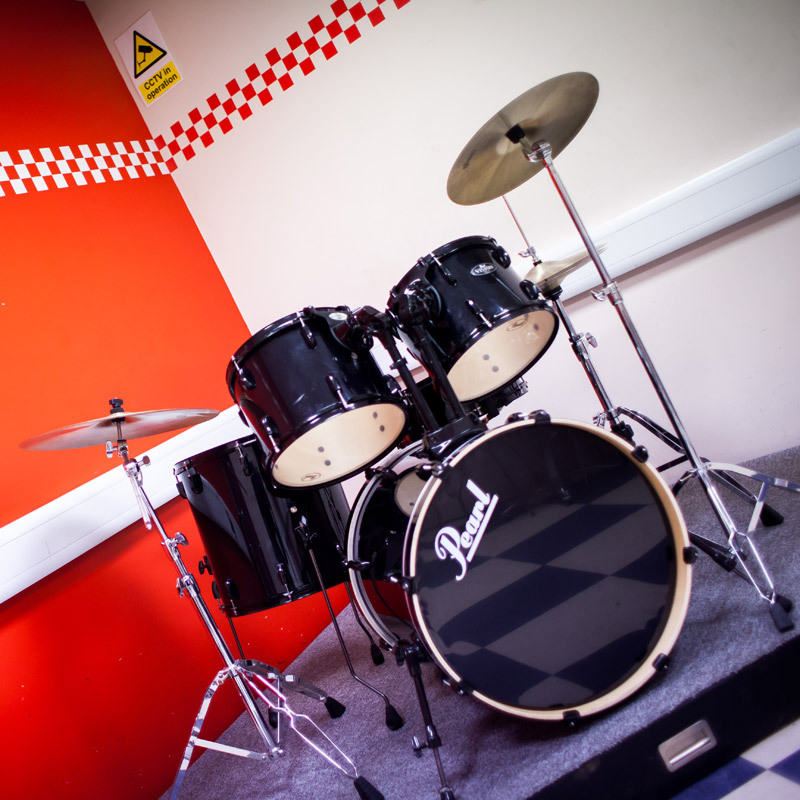 The drum studio is perfect for both practice and lessons.